The 19th of June is women’s rights day in Iceland. This year there are 100 years since women were first allowed to vote in Iceland. On June 19th 1915 women over the age of 40 were the first women granted the right to vote. To celebrate the occasion there are big events all across the country with many companies giving their employees the afternoon off to take part in the celebrations. 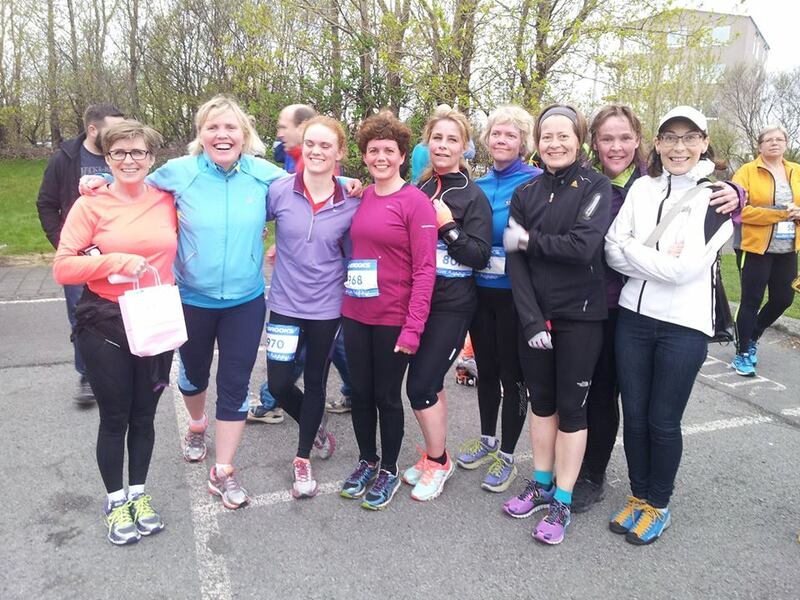 Running in Iceland would like to celebrate the day by focusing on women’s increasing participation in all sports, and in particular Iceland’s main running event, the Reykjavik Marathon. As far as we know the first Icelandic women to run a marathon was Ingunn Benediktsdóttir in New York 1979. 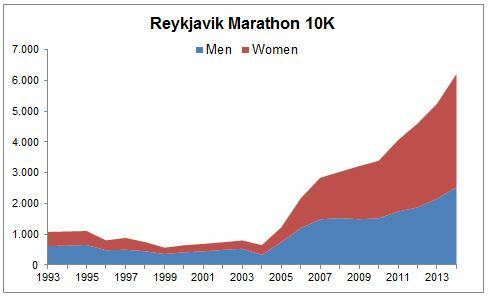 The inaugural Reykjavik marathon was 5 years later, 1984. That first year only 5 women took part, the only Icelander among them Fríða Bjarnadóttir. 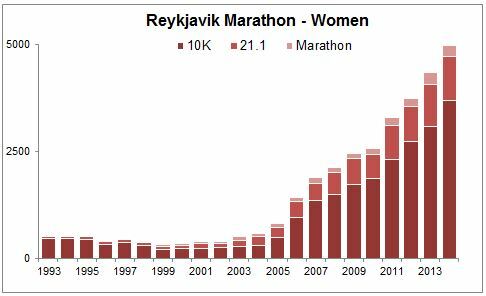 Only 16 women ran the halfmarathon, and 30 the 7K fun run where Icelandic running legend Martha Ernstdóttir was the winner. A lot has changed since then, with almost 5000 women taking part last year. 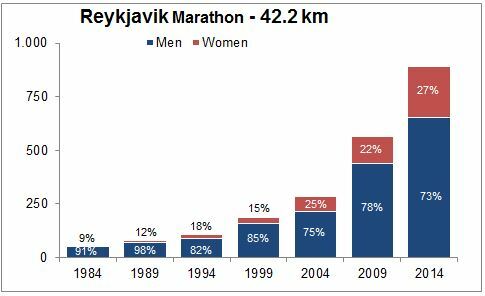 Icelandic women are clearly getting fitter and faster and now outnumber the men in the Reykjavik Marathon. 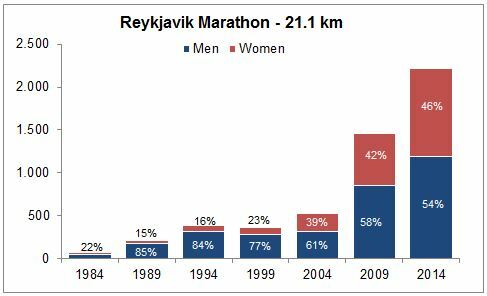 Reykjavik marathon has grown immensely from the start in 1984 when 214 runners participated compared to 9,320 participants in 2014. The development of women’s participation has been very positive as number of women has increased enormously or from 50 women in 1984 to 4,957 in 2014. 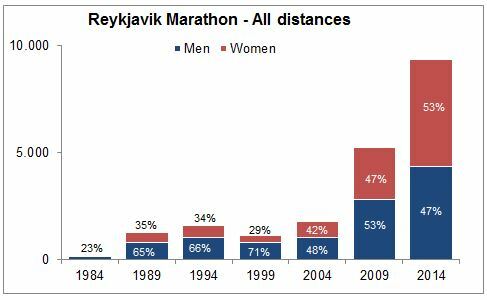 In 1984 women were 23% of all participants but in 2004 the ratio was up to 42%. From 2011 women outnumber men in total participation. 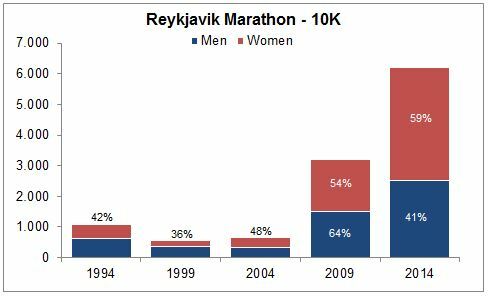 The increase in women’s participation is mainly driven by the 10K. 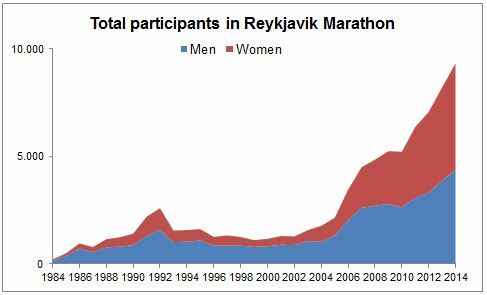 Running in Iceland gathered data on the number of participants in the Reykjavik Marathon. We looked at the full marathon, half marathon, 10K and 7K distances and analyzed the data by gender. From 1984 to 1992 there was no 10K run only 7K but in 1992 the 10K race replaced the 7K race.